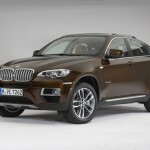 The BMW X6 is a mid-size luxury crossover. The first generation (E71) was released for sale in April 2008 for the 2009 model year The X6 was marketed as a Sports Activity Coupé (SAC). 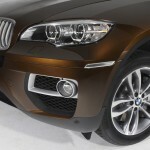 Official Release: BMW today revealed the first images and information about the newly updated 2013 BMW X6 Sports Activity Coupe which arrives in US BMW Centers this spring. The world’s first ever Sports Activity Coupe stills offers a unique combination of sporty dynamics, versatility and unmatched character. Select design updates and innovative features further hone the profile of the new BMW X6 as a distinctive model within the premium segment of all-wheel-drive vehicles. Its ongoing popularity is due to both its highly expressive design, which combines the athletic and elegant lines of a coupe with the unique character of a BMW X model, and the outstanding driving experience provided by two powerful engines featuring BMW TwinPower Turbo Technology and xDrive, the intelligent all-wheel-drive system. The BMW X6 continues to offer Dynamic Performance Control which gives the Sports Activity Coupe unparalleled agility for a vehicle in this segment. Since its market launch, more than 150,000 Sports Activity Coupes have been sold globally in the last three years with over 20,000 sold here in the US. This has far exceeded the original expectations. The continuing high level of demand for the BMW X6 on worldwide markets is affirmation of the ground-breaking vehicle concept of the Sports Activity Coupe. Striking design features front and rear, adaptive LED headlamps a new option. Precisely modified up front give the new BMW X6 an appearance characterized by athleticism and style. The standard foglights are now set in matt finish surrounds in the upper area of the outer air inlets. Their higher and more lateral position emphasizes the width of the vehicle. The striking three-dimensional modeling of the frame and newly designed bars, angled in the lower section, make the BMW kidney grille stand out conspicuously in the vehicle’s front end. The angle of the grille bars is flush with the bottom of the headlamp units, thereby creating an additional horizontal line which likewise highlights the wide track and road-holding prowess of the new BMW X6. 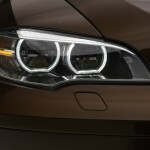 As an alternative to the standard Xenon headlights, the new BMW X6 is the first vehicle in its segment to be available with adaptive LED headlights. Their bright white light ensures optimum visibility, while their high-quality appearance represents a new interpretation of the brand’s hallmark twin circular headlamps. The three-dimensionally shaped luminous rings of the adaptive LED headlights are strikingly leveled off both at the top and bottom and are overlaid at the upper edge by an LED-fed accent light. The light sources for low and high beam light are LED units positioned on a horizontal bar at its center, feeding their light into the reflectors in front. With its newly designed taillights with LED technology, the powerfully shaped rear of the new BMW X6 also features more intense styling. The taillights are now two LED-fed light banks which create the brand’s hallmark night design as a harmoniously glowing light mass. The fact that they are horizontally aligned and stretch far out to the sides emphasizes both the width of the vehicle and the flowing transition between the rear quarter and the tail-end. Attractive new paint finishes, light alloy wheel and leather trim further enhance the new look. The program of external paint finishes for the new BMW X6 consists of two non-metallic and nine metallic colors, including Marrakesh Brown metallic, Orion Silver metallic and Midnight Blue metallic. 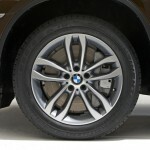 The standard equipment range of the new BMW X6 also includes a new 19-inch light alloy wheel style for the X6 xDrive50i. The standard Nevada leather upholstery is now also available in Vermilion Red. Also available is a new Nappa Leather upholstery in Ivory White. 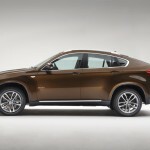 The new BMW X6 comes standard as a four-seat model. A three-seat rear bench is available as an option. The luggage compartment volume of the Sports Activity Coupe is 25.6 cubic feet (570 liters) and can be extended to up to nearly 60 cu.-ft. (1,450 liters) by folding down the rear backrests. 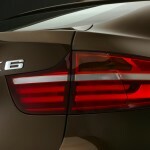 The new BMW X6: dynamic, unparalled, efficient, innovative. The BMW X6 will again be offered in two models in the US, the X6 xDrive50i which features BMW’s 4.4-liter 400 hp TwinPower Turbo V8 and the X6 xDrive35i with BMW’s award-winning 300 hp TwinPower Turbo inline-6. Both are mated to BMW’s 8-speed automatic transmission for a unique blend of responsiveness and efficiency. 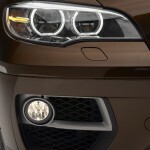 As an additional option, the M Performance Package is available in the US. This attractive equipment package is not just cosmetic. 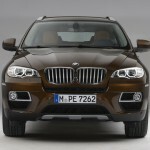 It includes an engine upgrade of +15hp and +30 lb-ft of torque on the X6 xDrive35i giving it 315 hp and 330 lb-ft. 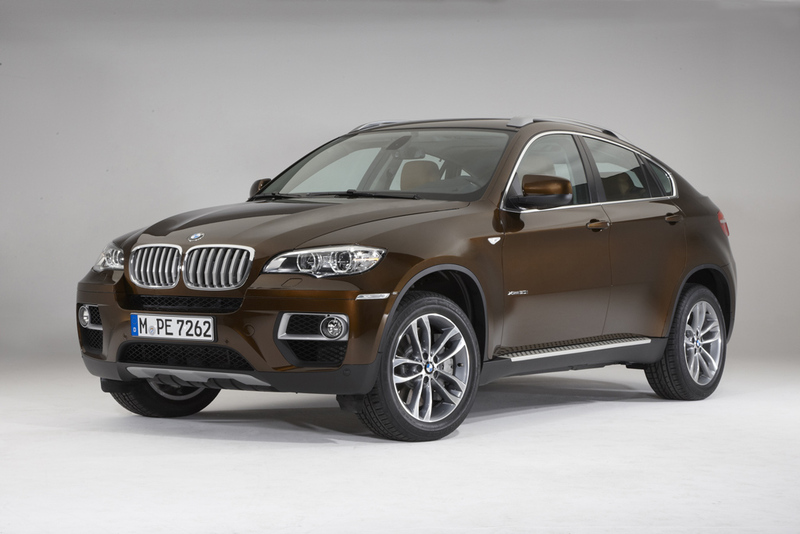 The increase is +40 hp +30 lb-ft of torque on the X6 xDrive50i for total peak output of 440 hp and 480 lb-ft. In addition, the M Performance Package includes 20-inch light alloy wheels, black chrome exhaust tips, stainless steel pedals, M foot rest and door sills, shadowline exterior trim, anthracite headliner, and optional Carbon Black metallic paint. As an additional product offer from BMW M GmbH, the specialists for high-performance sports cars, the BMW X6M with its V8 engine delivering 555 bhp also benefits from detailed refinements in the area of design and equipment. The BMW X6 M is fitted with a 6-speed M Sport automatic transmission, also highlighting its individual status with such features as separately developed suspension technology. The BMW X6 remains unique in the industry for its blend of style, performance and versatility. The updated 2013 model refines that character ensuring the continued success of the world’s first Sports Activity Coupe. 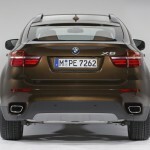 The 2013 BMW X6 arrives in US showrooms in the spring of 2012.